Gov. 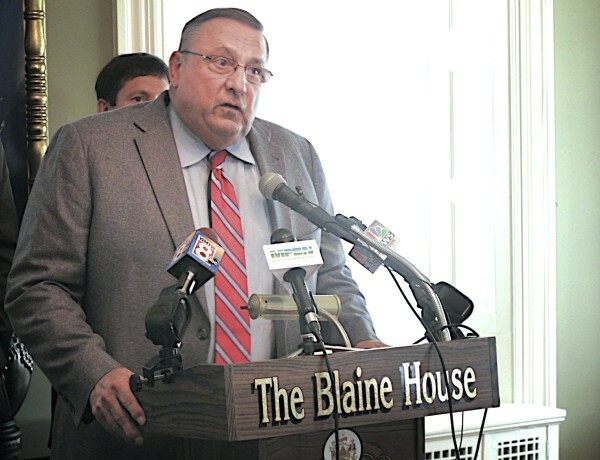 Paul LePage said on May 29 at the Blaine House that Democrats' opposition to his constitutional amendment to repeal the income tax is "despicable." He also pledged to veto every bill sponsored by a Democrat until his opposition relents and accepts his constitutional amendment to eliminate Maine’s income tax. AUGUSTA, Maine — Gov. Paul LePage on Monday made good on a previous threat to veto all Democrat-sponsored bills if the Legislature rejected his constitutional amendment to kill the income tax. Mere hours after the House of Representatives voted 82-64 against the bill, LePage released memos indicating he’d vetoed 10 bills sponsored by Democrats. Each of the 10 veto letters carried the same message. “As promised, I am vetoing all bills sponsored by Democrats because they have stifled the voice of Maine citizens by preventing them from voting on the elimination of the income tax,” LePage wrote. A constitutional amendment requires two-thirds support in the Maine Legislature, after which it is sent out for ratification by voters. The vetoed bills run a broad spectrum, including an effort to shield personal disability information from public records requests and a resolve to give a state-owned park to the town of Kittery. LePage made his veto threat to Democrats during a fiery, wide-ranging news conference 10 days ago. Furious that his opposition did not support his effort to kill the income tax, LePage said he would force every bill sponsored by a Democrat to win the support of two-thirds of the Legislature — the necessary threshold to override a veto. Adrienne Bennett, LePage’s spokeswoman, said that because lawmakers have the power to override a veto, LePage isn’t preventing any bill from becoming a law. Opponents of LePage’s income tax-killing constitutional amendment have said it’s irresponsible to legislate away half the state’s revenue without a plan in place to either make up for it through other means or drastically cut state spending. Because the bill includes no language for how to fill the roughly $1.7 billion hole that would be created by eliminating the income tax, Democrats have said the state will have no choice but to cut critical spending on education and health care — the two largest items in the state’s budget. “Maine families balance their budgets every day, and if they want something, they have to pay for it. Gov. LePage and his Republican allies have not said where this $1.7 billion is going to come from,” said Rep Adam Goode, D-Bangor, the House chairman of the Taxation Committee. In his veto letters, LePage was adamant that Democrats were “disenfranchising” voters by not sending the constitutional amendment out for a referendum. “Rather than work with me to at least give the Maine people a chance to vote on lowering or eliminating the income tax, they closed the door,” he wrote. House Majority Leader Jeff McCabe, D-Skowhegan, said his party would not be bullied into voting for a bill they didn’t support, and so he expected “dozens” more vetoes with the same message. Senate President Mike Thibodeau, R-Winterport, said that while he had not seen the veto message yet, he’d be looking at each individual bill as they came back to the Senate for override votes.